No legislature in the world has a greater influence over its nation's public affairs than the US Congress. The Congress's centrality in the US system of government has placed research on Congress at the heart of scholarship on American politics. Generations of American government scholars working in a wide range of methodological traditions have focused their analysis on understanding Congress, both as a lawmaking and a representative institution. The purpose of this volume is to take stock of this impressive and diverse literature, identifying areas of accomplishment and promising directions for future work. 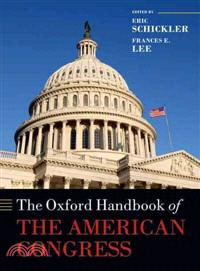 The editors have commissioned 37 chapters by leading scholars in the field, each chapter critically engages the scholarship focusing on a particular aspect of congressional politics, including the institution's responsiveness to the American public, its procedures and capacities for policymaking, its internal procedures and development, relationships between the branches of government, and the scholarly methodologies for approaching these topics. The Handbook also includes chapters addressing timely questions, including partisan polarization, congressional war powers, and the supermajoritarian procedures of the contemporary Senate. Beyond simply bringing readers up to speed on the current state of research, the volume offers critical assessments of how each literature has progressed - or failed to progress - in recent decades. The chapters identify the major questions posed by each line of research and assess the degree to which the answers developed in the literature are persuasive. The goal is not simply to tell us where we have been as a field, but to set an agenda for research on Congress for the next decade. Eric Schickler is the author of Disjointed Pluralism: Institutional Innovation and the Development of the U.S. Congress (Princeton University Press, 2001) and co-author, with Greg Wawro, of Filibuster: Obstruction and Lawmaking in the U.S. Senate (Princeton University Press, 2006). Both books received APSA's Richard F. Fenno Award for the best book published on legislative politics. He is also co-author of Partisan Hearts and Minds (with Donald Green and Bradley Palmquist), which was published in 2002 (Yale University Press). He has authored or co-authored articles in the American Political Science Review, American Journal of Political Science, Journal of Politics, Legislative Studies Quarterly, Comparative Political Studies, Studies in American Political Development, Public Opinion Quarterly, and Social Science History. He is Jeffrey and Ashley McDermott Chair in Political Science at the University of California, Berkeley. Frances E. Lee is author of Beyond Ideology: Politics, Principles and Partisanship in the U.S. Senate (University of Chicago Press, 2009), coauthor of Sizing Up The Senate: The Unequal Consequences of Equal Representation (University of Chicago Press 1999), and co-author of a comprehensive textbook on the U.S. Congress, Congress and Its Members (CQ Press). Her research has appeared in the American Political Science Review, American Journal of Political Science, Journal of Politics, and Legislative Studies Quarterly. Her work has received national recognition, including the APSA's E. E. Schattschneider Award for the best dissertation in American Politics, the D. B. Hardeman Award presented by the Lyndon Baines Johnson Foundation for the best book on a congressional topic, and the APSA's Richard F. Fenno, Jr. Award for the best book on legislative politics published. She is Professor of Government and Politics at the University of Maryland-College Park.